Old age is often associated with a progressive loss of muscle mass, strength and functional performance, such as struggling to climb the stairs, get out of a low chair or get up from the floor easily, to name but a few. 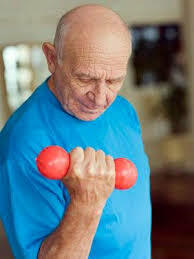 This form of loss of muscle mass is known as ‘Sarcopenia’ and is often regarded as a ‘given‘ or ‘normal healthy ageing‘. However, the good news is that research shows this is not always or need not be the case. This loss of strength and function can be attributed more to a change of lifestyle as we age and retire, with us often becoming more sedentary and reducing the amount of exercise we do, rather than normal changes associated with ageing. While the media regularly talks about the poor nutrition and sedentary lifestyles of the younger generation in modern society, making our youth of today ill, current research suggests it may also be a factor in how our neuro-muscular systems age. So before we press on, here is a little bit more background evidence to support my ‘Tips and Suggestions’ for later. As we age, the number of ‘Motor units’ (main nerves) supplying our muscles reduces, so the nerves that remain have to send off compensatory sprouts to continue to supply the muscle cells that service the muscle belly. The research suggests that the new fibres that sprout are slower twitch nerve fibres, which can explain the observed loss of type 2, fast twitch fibres in some older people ( Tieland et al 2018). Although this means we may not be as quick with our reaction speeds or be able to sprint as fast as we age, studies have shown that healthy, active older adults can preserve their ability to activate their motor units optimally by continuing to work their skeletal muscle system regularly. The Muscular system and Connective tissue. Therefore the message from this is that ‘Sarcopenia’ and loss of muscle function appears to be a natural ageing process in sedentary adults, Not healthy active ones. Effects of Nutrition and ageing. The balance between skeletal muscle breakdown and the ability to build muscle back up again is strongly influenced by levels of Amino acids, the building blocks for Protein, circulating in the blood. The timing of when we eat in relation to when we exercise is looking more and more to be a key factor in how our body can utilise these building blocks, hence the fairly recent growth and development of multi billion pound industries selling sports drinks and training supplements. Studies have shown that a bout of resistance or Aerobic exercise( 45 minute brisk walk) performed before eating a Protein rich meal improves muscle building ability. The main difference between older and younger people is that the older you are the more protein compared to Carbohydrate you need to consume at each meal. 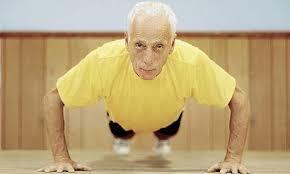 It is suggested that between 20-40 grams of protein per day is required in older adults. If this is achieved the response in muscle synthesis has been shown to be equally as effective as with younger adults (Dickinson et al 2013). ‘Leucine’, which is an essential amino acid, has been suggested as a food supplement which is helpful in the maintenance of skeletal muscle health. It has been shown to be a potent simulator for muscle growth. Leucine is found in many protein rich foods such as Cheese, Soybeans, Beef, Chicken, Pork, Seeds and Nuts, including peanut butter, Fish and Seafood and all types of Beans. Around 39 mg /Kg of body weight is recommended or 2 grams/7 grams of protein ( Katsanos et al 2006; Paddon-Jones& Rasmussen 2009). Vitamin D and Omega 3 fatty acids have also been shown to alleviate systemic inflammation and increase muscle volume and strength in the elderly (Dalle et al 2017). 8 Top tips for building or maintaining healthy muscle . Exercise four times per week with a combination of slow controlled resistance training such as weight training or the use of body weight (Squats, Calf raisers, Push-ups) or resistance bands, and brisk Aerobic workouts such as walking, cycling or Swimming. Seek an achievable and sustainable programme of exercises backed up by a physiotherapist or good experienced personal trainer which is tailored to your specific needs. Avoid generic advice and programmes off the internet. Although it can be informative Google does not know everything and is not tailored to your specific needs. 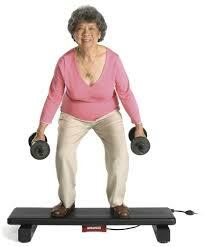 Make sure whatever exercise you choose it is fun and enjoyable. This way you are more likely to stick at it. Don’t be afraid to try something new like Dancing or Nordic walking. These forms of exercise, with a group of like minded people can keep you motivated and stimulate you to work harder. Gardening for 1 hour or longer. Take a long look at your general lifestyle and look for changes you can make with either your diet to take in the above mentioned factors, walking instead of using the car, or just better time management to allow quality time to devote to exercise. Yoga and Pilates ! These are not just a gentle stretch or slow workouts on mats. They can work you very hard and build strength. Sleep well. Sleep is when the body heals and muscle building is at its greatest. If you are a poor sleeper or do not get enough, look at ways of switching off and relaxing your brain before bed and try to stick to a regular bed time as routine really does help. NB: It is always wise to get the all clear from your General Practitioner, Nurse practitioner or a qualified health care professional before embarking on any vigorous programme of exercise.